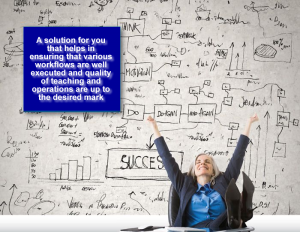 For School Administrators - a solution for you that helps in ensuring that various workflows are well executed and quality of teaching and operations are up to the desired mark. As everywhere everyone wants things to be done in an easier and faster way, our team have redeveloped a strategy which aims at the development of administrative and management structures in all the schools of the country. We believe that since most schools as yours are already equipped with necessary hardware and network structures, it will be a great idea to adopt our world class education application. Our Software application allows Management to capture and store important information to meet compliance and archival needs. It helps in ensuring that various workflows are well executed and quality of teaching and operations are up to the desired mark. It helps everyone at various levels of work flow. Our School Management App is a large database system which can be used for managing your school’s daily work. It is configurable and can be configured to meet your school’s needs. It is a multi-user system and can be used by hundreds of users at same time. It is designed for better interaction between students, teachers, parents & management. This management software very gracefully handles all the requirements for easy school management. The school management system being web based can be accessed from anywhere in the world, which enables the students, teachers, parents and the management be in touch with each other at all times. Very interestingly, your data is safe and secure in the cloud for future use. We shall acknowledge your request for a live demo at your convenience. School management system is network based. Admin shall add new student, teacher, and class and modify them. Admin shall update school news. Admin shall access all the data about student. Admin shall manage the school activity. Admin shall generate time table. Student shall login by his/her ID. Student shall submit assignment online (if necessary). Student shall view the news event of the school. Student shall take test online (if necessary). Student shall communicate with the teacher. Teacher shall communicate with admin, student and parents of the student. Teacher shall assign assignments to his student. Teacher shall collect assignment of his student. Teacher shall mark attendance online. Teacher shall declare result online. Parent shall login through his/her child ID. Parent shall view reports of his child. Parent shall communicate with teacher. Reliable update on child’s attendance, progress report and fee payment.